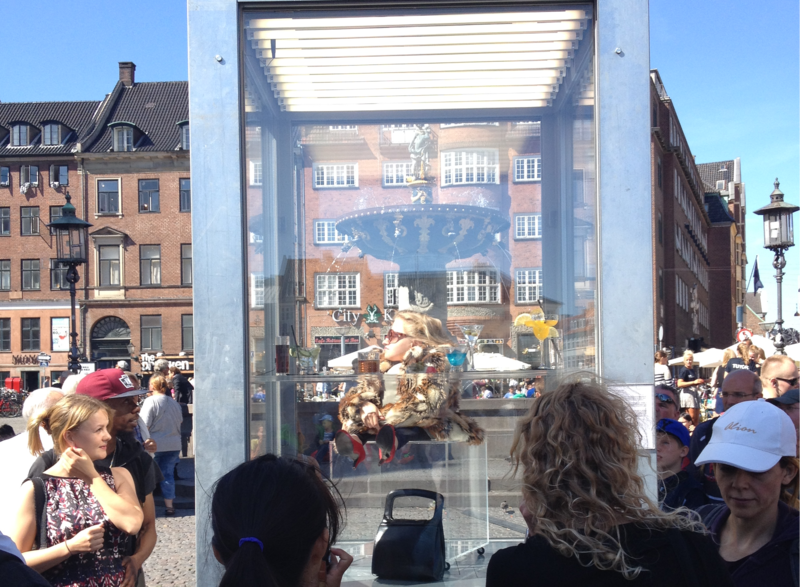 Today the display box has been in Copenhagen at Gammel Torv for a week. It means that some people have returned during the week to see what topic or taboo is taken up today. Also a lot of new people visit or bump into the installation “Ceci n’est pas” by the Dutch artist Dries Verhoeven. A couple of English speaking young women go: “I pass by this every day and still I don’t get it.” They don’t stop to figure out. Other people who stay a little longer show the wish to discuss with each other today. When the shutters go up a woman dressed in a fur with red high-heeled shoes and black shiny tights is appearing. She sits at a stool at a bar table full of drinks. She looks around and rocks a little to the party music, which is pumping out of the box. A pretty normal sight, if you go out in the Copenhagen nightlife. What is remarkable is her height. She is very little and her legs are very short. She lights a cigarette and looks around at the audience with a flirtatious look. Today’s topic about physical handicap and sexual ideals shown in this way shocks and provokes the audience. “Is it real person?” This is by the way a frequently asked question everyday. Maybe because we are not use to see a person exhibited in a glass box in a public space… anymore. It is something that belongs to the past. Three elderly ladies walk by the box: “This is like in the past, where people were exhibited – I don’t like it.” They choose not to stay for so long. Other people among the audience stay a little bit longer. Some people think that the glass chair makes an optical illusion and that her legs are hidden underneath. Especially many Danish youngsters appear to be unfamiliar with the sight of a little person. It seems like they find it hard to talk about it in a proper manner and they leave quite quickly. A part of grown-up crowd takes their time to discuss and hear the different point of views, for instance two young women and an elderly old lady. The lady thinks it is grotesque to display the woman in this way. The two women express that they think it is an interesting way to draw attention to the topic. Their discussion is a proof of that, one of them says. It makes them think about whether it is right to choose not to have a baby with a physical handicap. The elderly lady is together with her friends. One of them remembers that for a long time ago she experienced an exhibition in Hamburg that exhibited little people from a circus, which gave her a bad association. Many people take their time to explain the context of today’s displayed woman. “Little people should also be able to enjoy life and go to a bar and so on. “ and “It is for the purpose of focus on the challenges of sexuality and having a physical handicap.”. “..It is about tolerance”, a man comic costume says. He has visited the installation several times either on his way to or home from a street performance in Strøget supposedly. Another man is expressing that he doesn’t like what he is seeing and he is ready to leave the square. After a discussion with a person, who problematizes his point of view, he chooses to go the box to read the text. Afterwards he changes his mind a bit and sees that the intention might not be to expose the woman inside the box against her will. Some people in the audience suggest that woman is an exhibitionist and that she is doing the show to attract attention. Other people say that this might be what she is doing for a living. There is quite some tension among the audience today. I seems like some people get offended by others taking pictures of the woman. This results in audience taking pictures of other people in the audience to document it. Some tourists choose openly to pose in front of the box for a Kodac moment or to wave and jump in front of the box. Today people some Danish people express that think the woman in the box is brave to sit in there with a whole crowd around her. “Brave”, “Fresh”,“She is so fine”. They smile to her. A group of Americans also seem to find the topic interesting after a longer discussion: “The more we talk about it, the more I start appreciating this contemporary art”. When shutters go up for the last time today the woman is lying still at her stool. A physical handicap often has a negative effect on sexual attraction. This is in part determined culturally. Socially accepted ideal images nestle themselves in the hypothalamus, the part of the brain that controls sexual attraction. It also has biological roots. Every human being unconsciously seeks to improve his species through reproduction, the so-called natural selection. He or she will search for the partner that appears most suitable for the creation of healthy and successful children. Screening for a possible genetic defect in a foetus has become part of standard prenatal screening programmes. The number of women who decide to interrupt their pregnancy due to an unwanted diagnosis has increased over the last decade. Et fysisk handikap har oftest negativ indflydelse på seksuel tiltrækningskraft. Dette skyldes til dels vores kultur. Socialt accepterede idealbilleder lagres i hypothalamus, den del af hjernen, der kontrollerer seksuel tiltrækning. Det har ligeledes biologiske rødder. Ethvert menneske søger ubevidst at forbedre arten gennem reproduktion, den såkaldte naturlige selektion. Han eller hun søger efter den partner, som forekommer bedst egnet til at skabe sunde og succesfulde børn. Det er blevet en del af det almindelige scanningsprogram for gravide at scanne for mulige genfejl i fostret. Antallet af kvinder, som vælger at afbryde deres graviditet på grund af en uønsket diagnose, er øget gennem de seneste ti år.